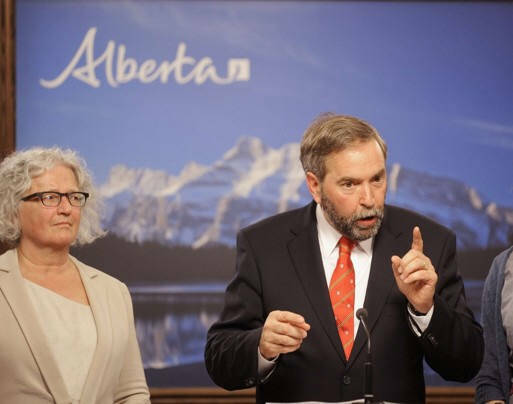 New Democratic Party leader Thomas Mulcair, right, speaks at the Alberta Legislative Building in Edmonton on Thursday after an aerial tour of the Alberta oil sands. For years, Canada has been seen as an environmental leader on the world stage, pushing other nations to tackle acid rain, save the ozone layer and sign global treaties to protect biodiversity. The government of Canadian Prime Minister Stephen Harper is rewriting the nation's environmental laws to speed the extraction and export of oil, minerals and other materials to a global market clamoring for Canada's natural resources. The government is saying, politically, we want to hitch our wagon to an economic development strategy in which natural resource extraction plays a very large part,- said Brian Crowley, managing director of the Macdonald-Laurier Institute, a public policy think tank in Ottawa. The government has added provisions to an omnibus budget bill that would revamp the way the government reviews the environmental impact of major projects, regulates threats to fisheries and scrutinizes the political activities of nonprofit groups. Economic and political factors account for the controversial gambit. High prices for oil and minerals, along with demand from Asia, have given Canada new incentive to tap into its resources, and new technology has made extraction easier. And while Harper has been prime minister for six years, his Conservative Party won an outright majority just one year ago. The strategy has won plaudits from energy industry officials and some economists, while sparking an outcry from environmentalists and their allies in Parliament. "The idea is simple and straightforward: to make Canada the most attractive country in the world for resource investment and development, and to enhance our world-class protection of the environment today for future generations of Canadians," said Christopher Plunkett, spokesman for the Canadian government in the United States. Rick Smith, executive director of the advocacy group Environmental Defence Canada, calls it "a war on nature and democracy." At least 500 Canadian organizations, along with several hundred in the United States, either darkened their Web sites or published notices Monday to protest the changes as part of a "Black Out, Speak Out" demonstration. In the U.S, the Natural Resources Defense Council had a pop-up black box on its homepage urging supporters to "Take action in solidarity with Canadian environmentalists," while the Sierra Club's site showed black oil dripping over the Canadian flag with the words, "Tar sands oil is destroying Canada's environment and poisoning its politics," after which the words flashed, "Rethink tar sands. Speak out now." The Canadian government launched a public relations counteroffensive Monday, sending 10 of its ministers out across the country to tout the benefits of overhauling the nation's resource development laws. "This is the most anti-environmental legislation we've seen in decades," Smith said. "Very clearly, a lot of these changes are designed to expedite inappropriate pipeline proposals. It's essentially a big gift to Big Oil." Canadians on both sides of the debate said the legislative changes would give the nation's oil and gas firms a quicker and more certain path for shipping their products overseas, rather than relying on the American market. The issue has taken on more urgency because it is uncertain whether the Obama administration will grant a presidential permit for TransCanada's proposed Keystone XL extension, a 1,700-mile pipeline that would ship heavy crude oil in Alberta to the Gulf Coast. After the administration rejected the permit in January, saying it could not evaluate it properly in the face of a congressionally mandated deadline, it has eased the way for the lower segment to go through and is reconsidering a permit for the leg between Alberta and Nebraska. Greg Stringham, vice president for markets and oil sands at the Canadian Association of Petroleum Producers, said the industry needs this regulatory streamlining to export its growing oil production to Asia. The association projects that oil output will rise from its current level of 3 million barrels a day to 5 million by 2025, which would make Canada the world's fourth-largest oil producer, behind Saudi Arabia, Russia and the United States. Some experts, however, say oil output might not grow that fast. "We've been wanting to get access to the global market," Stringham said, adding that the changes could shave two years off the time it would take to get approval for a major pipeline without changing the underlying environmental standards. Plunkett said the government has a duty to promote investments in the energy and mining industries. But even backers of the government plan acknowledge that Canada is divided on how to exploit its fossil fuel and mineral wealth. "Canadians have a belief system that's highly aspirational, where there's this ideal of mountains, rivers and wilderness," said Peter Robinson, chief executive of the David Suzuki Foundation, which focuses on environmental issues. Enbridge spokesman Paul Stanway, whose company has proposed building a major pipeline from Alberta to British Columbia's coast to ship oil sands crude to Asia, said the country is split between those producing energy and those consuming it. "It produces a bit of a split personality," Stanway said. "It's something we need to sort out as a country and figure out where we want to go on this." The budget bill also would amend the Fisheries Act so it would only bar activities that do "serious harm" to fish in a commercial, recreational or aboriginal fishery, or which supply those fisheries. Plunkett said the change would allow federal officials "to focus its efforts on managing key threats to Canada's commercial, recreational and aboriginal fisheries" and "provide greater certainty and consistency to industry." But it could also ease the way for pipelines through British Columbia, because there are so many waterways there that the Northern Gateway project would cross that don't have formal fisheries, according to Nicholas K. Dulvy, Canada research chairman in the marine biodiversity and conservation program at Simon Fraser University. "Imagine if you're crossing a thousand watersheds, that's about a thousand environmental impact statements," said Dulvy, one of a group of scientists who warned the government in a letter Tuesday that the change would remove protections for "most of Canada's freshwater fish." The measure also includes cutbacks in federal scientific programs, such as shutting down the Department of Fisheries and Oceans' ocean contaminants unit and experimental lake program. Kristy Duncan, a member of the Liberal Party with responsibility for the environment, described the legislation as "removing the safeguards of the last 50 years." She said the opposition was largely powerless to stop it. Joel Wood, a senior research economist for the free-market-oriented Fraser Institute, said "the environmental shift has been overblown," noting that Canada was pushing ahead with measures such as the same tighter fuel-efficiency standards the United States is adopting for cars and light trucks. But several U.S. experts involved in international environmental talks said Canada was no longer pushing for stricter protections on a range of issues. U.N. Foundation President Timothy Wirth, who served as undersecretary of state for global affairs under President Bill Clinton, said he recalled how Canadian officials would push the United States to go further in protecting salmon and cutting greenhouse-gas emissions. "They were very progressive," said Wirth, who has just returned from a trip to Canada. "Energy was not nearly as big as it is now. ... This has become an overwhelmingly dominant issue."